Continuum was founded by Tim Mondavi, his father Robert Mondavi and his sister, Marcia Mondavi in 2005 following the sale of the Robert Mondavi Winery to Constellation Brands in December 2004 for one billion dollars. Continuum remains a family affair, with his children all working at the property in various capacities. Construction began taking place for the new winery at Continuum, which was completed in time for the 2013 harvest. Continuum is an interesting project, as in many ways, it is quite different from the Robert Mondavi Winery that Tim was previously in charge of. For example, Robert Mondavi produced a plethora of different wines at various price levels, from a diverse array of grapes. That is not the case here as Continuum focuses on one main wine. Next, for a period of time, the Robert Mondavi Winery under Tim Mondavi began to produce wines that were lighter in style from less ripe grapes that were considered food friendly. That is also not the case here, as Continuum is making delicious, ripe, rich styled wines. At first, Continuum was able to produce wine from fruit planted in the to Kaylon vineyard. When that was obviously no longer possible, they purchased vines on Pritchard Hill, which became the grape source and home for Continuum. Since 2008, the vast majority of fruit has come from their Pritchard Hill vineyard. By 2012, they were only using estate grown grapes. It is the goal of Tim Mondavi to continue increasing the size of the vineyards until they reach 60 planted acres out of the large, 173 acre estate. As of 2016, they had 41 acres under vine. Continuum made its debut with the 2005 vintage. The vineyard is ideally placed on Pritchard Hill with soil types that include rock, volcanic, clay and loam soils on elevations that range from 1,325 feet up to 1,600 feet. The vineyard is planted to 55% Cabernet Sauvignon, 30% Cabernet Franc, 11%, Petit Verdot and 4% Merlot. 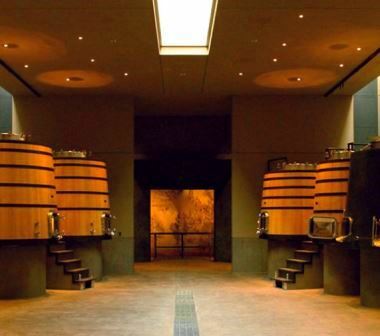 Vinification of Continuum takes place in a combination of conical shaped oak vats, Sonoma Cast Stone and Nomblot egg shaped tanks with 10% of the wine being vinified in barrel. The wine is then aged in 85% new, French oak barrels for up to 20 months before bottling. Continuum is usually a Left Bank Bordeaux blend of approximately 78% Cabernet Sauvignon, 11% Cabernet Franc, 6% Merlot and 5% Petit Verdot from vines planted on Pritchard Hill. Novicium is considered the second wine of Continuum and is more of a Right Bank Bordeaux blend produced from 52% Merlot, 26% Cabernet Franc and 22% Cabernet Sauvignon. Continuum wines are best served at 15.5 degrees Celsius, 60 degrees Fahrenheit. The cool, almost cellar temperature gives the wine more freshness and lift. Young vintages of their red wine can be decanted for 1-3 hours, depending on the character of the vintage. This allows the wine to soften and open its perfume. Older vintages might need very little decanting, just enough to remove the sediment. Continuum is best served with all types of classic meat dishes, veal, pork, beef, lamb, duck, game, roast chicken, ribs, hamburgers, barbecue, roasted, braised, grilled dishes and stews. Continuum is also good with Asian dishes, hearty fish courses like tuna, salmon, mushrooms and pasta. This is quite stylish, with its lush, round, plush textures, nose of fresh flowers, black and blue fruits, coffee bean and ripe black cherries. Forward in its approach, this is fun to drink now and it's only get to get better with age. Stylish, Left Bank Bordeaux blend with round, textures, soft tannins, ripe, dark fruits and a polished finish, with just enough oak to flesh out the wine, but not too much so that it takes away from the fruit. Earth, truffle, ripe black cherry, oak and incense notes open to a medium/full bodied expression of an age worthy, Cabernet Sauvignon. The finish is filled with ripe, fresh, spicy red and black fruits. A few years of bottle age should add a lot complexity to the wine.